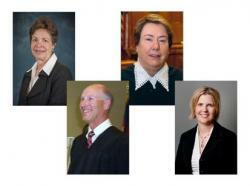 In celebration of the Colorado judiciary, CJI is pleased to announce the recipients of the 2011 CJI Judicial Excellence Awards. The four recipients are: Judge O. John Kuenhold, Judge C. Jean Stewart, Judge Christine A. Carney and Magistrate Stephanie L. Rubinstein. The Honorable O. John Kuenhold of the 12th Judicial District is one of two honorees in the District Court category. He was appointed Chief Judge in 2004, 22 years after Governor Lamm appointed him District Court Judge in 1981. He recently stepped down after 30+ years on the bench. Judge Kuenhold graduated from the University of Michigan Law School in 1969 and shortly thereafter arrived in the San Luis Valley as a Vista volunteer and Reginald Heber Smith Fellow in poverty law. He opened the Colorado Rural Legal Services office where he worked for 5 years. He took a year off to travel to Latin America, returning to Alamosa to open a private practice. Because he accepted whatever cases came through the door, he soon gained experience in many areas of law and so he felt well-prepared when he was appointed to the bench in 1981. As Water Judge for Water Division 3 (Rio Grande Basin), he was recognized as the most experienced and primary Water Court judge. He also garnered a national reputation for advancing technology in the courts. His most notable achievements are the initiation of the Colorado Courts’ website and serving as web-master. In addition to serving on numerous committees, Judge Kuenhold frequently presented at state, national and international judicial education programs. In 1995 he was a nominated to the Colorado Supreme Court and named “Colorado’s Outstanding Judicial Officer” in 2006. He’s chaired the Colorado State Community Corrections Advisory Council for 20 years, and to celebrate his dedication, the Council named their annual award, the O. John Kuenhold Award. The second honoree in the District Court category is the Honorable C. Jean Stewart, Presiding Judge of the Denver Probate Court. Judge C. Jean Stewart was born in a farmhouse in Western Pennsylvania and attended elementary classes in a two room schoolhouse. With the intention of a teaching career, Judge Stewart graduated from Clarion State Teacher’s College in 1967 with a Bachelor’s Degree in Education. She went on to receive a Master’s Degree in Interpersonal Communications at Ohio University in 1968. While working on her doctorate at the University of Denver, she acknowledged her reservations regarding a career in academia. Changing her mindset from education to law, Judge Stewart earned her J.D. in 1974 from the University of Denver College of Law where she served as the first woman Editor- in- Chief of the Denver Law Journal and was elected to the Order of St. Ives. Soon after she was admitted to the Colorado Bar in 1975, she clerked for the Honorable Sherman Finesilver, a Federal District Court judge for the District of Colorado. When Judge Stewart’s clerkship came to an end, she joined Holland & Hart LLP and then moved to Holme Roberts & Owen LLP where she was mentored by Bill Huff, her former DU law school wills and trusts professor. In 1995, she was appointed to the Denver Probate Court by Governor Romer. After 16 years of serving the public, Judge Stewart stepped down from the bench on June 30, 2011. She returned to Holland & Hart LLP where her career as an attorney began. She was eager to return to private endeavors, including serving as a mediator, offering herself as an appointed judge, and working with a task force on national probate court standards. Judge Stewart has been recognized by Colorado Law Week’s “Lawyers of the Decade, 2011;” by the Denver Business Journal’s “Outstanding Women in Business, 2011;” and honored as the 2006 recipient of East High School’s A+ Angels Award. The Honorable Christine A. Carney of the Larimer County Court is the 2011 recipient in the County Court category. Eager to begin a career in the hotel industry, Judge Carney received a B.A. in Hotel, Restaurant and Institutional Management from Michigan State University. After taking some elective law classes at MSU, Judge Carney realized law was in her blood – literally. Her grandfather, Leland W. Carr, had been the Chief Justice of the Michigan Supreme Court and her brother had become a District Court Judge in their hometown. She found law classes challenged her like nothing else and thoroughly enjoyed them. Simply taking those few electives was a life changing experience that brought law to the forefront as a possible career. She decided to attend law school in a place where she could settle. That place was Colorado. Judge Carney attended law school at the University of Colorado, receiving her J.D. in 1980. She worked for a sole practitioner, joined the Pueblo District Attorney’s office and worked independently in private practice. In 1986, she joined law school classmates in a small practice, moving to Fort Collins. In 1998 Judge Carney made history by becoming the first female judge for Larimer County. She mentors new appointees and shares her enthusiasm about the Colorado justice system by working with new attorneys and speaking to youth groups. As a testament to Judge Carney’s excellence, she was the recipient of the 2011 Conrad Ball Award. This award is given to those who significantly improve the quality of criminal justice in Larimer County. Magistrate Stephanie L. Rubinstein of the 21st Judicial District (Mesa County) is the honoree in the Magistrate category. Magistrate Stephanie Rubinstein was born in Pittsburgh, Pennsylvania, but spent most of her growing up years in Holts Summit, Missouri. Her first inclination of becoming a lawyer was via an aptitude test as a sophomore in high school in Jefferson City, Missouri. Not knowing much about the profession, she conducted due diligence by participating in mock trials, speech competitions and a teen court program. She discovered she enjoyed every aspect of considering the issues of a case, preparing for a hearing, and advocating for a position. She graduated in 1993 from Northeast Missouri State University (Truman State University) earning a Bachelor’s Degree in English. With every intention of attending the University of Missouri –Kansas City Law School, her path changed courses when Drake University Law School offered her a scholarship. As destiny would have it, she met her husband, Dan, the first day of law school at Drake. After graduating in 1996, she and Dan moved to Grand Junction where she served the community working for Colorado Legal Services. She worked as Staff Attorney for the City of Grand Junction for 4 ½ years, then entered private practice. In 2006, she was appointed to the position of Magistrate. In addition to being a devoted wife and the mother of two, Magistrate Rubinstein serves on the Mesa County Pro Bono Board, the Access to Justice Committee and on the Supreme Court subcommittee, Qualification and Complaint Process for CFI’s.